Last week, Elizabeth started explaining how to help children who find the ‘th’ sound difficult. First of all, we need to work out exactly what the problem is, then the child needs to practise listening to the f and th sounds when you say them to make sure that they can consistently identify which one you said. You can find out more about these steps by reading Elizabeth’s post here. 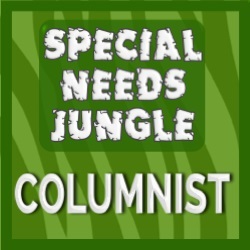 Today’s post is about what to do next, when you are sure that your child knows the difference between the two sounds. Keep trying the ‘th’ sound until your child can say it reliably without too much prompting. Always ask them to do lots of sounds that are easy for them too. This helps them to stay motivated, and also helps them to move their mouth into the right position and away again so that they remember what they need to do. Next, your child needs to practise the sound in single words. Many children find it easier to start with the target sound at the beginning of words. At this point you might find that the child can’t blend the ‘th’ and the rest of the word together or you might get a ‘th’ and an ‘f’ (eg they might say thfink instead of think). If this happens, slow the word down and see if the child can copy e.g. th..ink. If the child is really struggling, I often say “I can hear a ‘f’ sound in there. We don’t need that. Listen again”. This stage can take a while so don’t rush through it too much. If your child is really struggling after several sessions of trying, take a break for a bit and come back to it another time. Remember to keep using games to keep it fun and keep praising your child’s attempts to keep them motivated. Now, your child needs to practise saying the new sound in sentences. Some children may need to practise short phrases of 1-2 words first of all (eg ‘big thumb’ or ‘small thumb’) before moving on to longer sentences. You can start by making up sentences for them to copy if you need to, but work towards your child making up their own sentences, as this is harder and more like natural conversation. As before, practise in short, regular sessions, keep playing games and keep praising your child for trying even if they find it tricky. At this point, it feels like your child is nearly there. They can say the new sound in sentences in practice sessions without any help. However, they are probably still not using the sound in conversation. This can seem frustrating – they can say it now, why don’t they?! However, this last step is actually a really tricky one and often takes quite a while. At the moment, your child still needs to think about saying a ‘th’ sound correctly and thinking about how they say every word is exhausting. None of us do that all the time when we are talking. Keep on practising until the new sound becomes as easy and natural for them as the ‘f’ they were saying before and at this point it should start to come into everyday conversation. There are some more ideas that you can try at this conversation stage in this post. 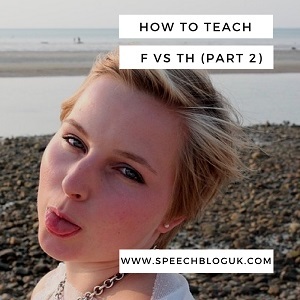 Your child has now learnt to use the ‘th’ sound – hurrah! You may need to repeat these steps to get the noisy ‘th’ sound, or to work on ends or middles of words instead of beginnings. Black Sheep Press have some great sound packs for teaching different sounds. You can find their ‘th’ pack here. 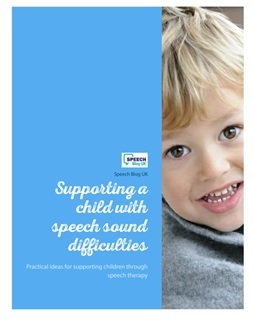 Also, if you want to learn more about teaching speech sounds generally, click on the link at the bottom of this post to join our mailing list and you will get an e-book about helping children with speech sound difficulties. Also check out our free and paid courses on the topic here.